Both Amazon and B&H have a similar deal on the unlocked U.S. version of the LG G6+. With support for AT&T and T-Mobile, the phone is priced at $499.99 from both retail outlets, a savings of $300 from their usual price. The only differences between this model and the LG G6 is the larger 128GB of internal storage on the G6+, and the 24-bit Hi-Fi Quad DAC not found on the U.S. version of the LG G6. 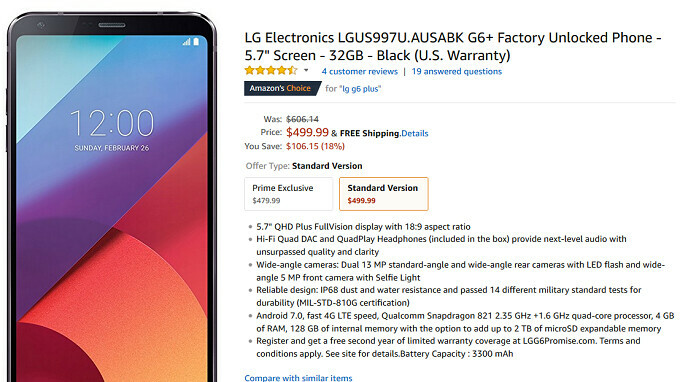 If you don't mind having your LG G6+ stuffed with the usual bloat from Amazon, you can save an additional $20 to purchase the Amazon Prime Exclusive version of the model for $479.99. The device carries a 5.7-inch LCD display with a resolution of 1440 x 2880 (yes, it has an 18:9 aspect ratio), and under the hood you'll find the Snapdragon 821 Mobile Platform with a quad-core CPU running at 2.35GHz. The Adreno 530 GPU handles graphics, and the handset is equipped with 4GB of RAM. A pair of 13MP cameras adorn the back, and there is a 5MP front-facing selfie shooter. The LG G6+ is rated IP68, which means that it can be submerged in up to nearly 5 feet of water for as long as 30 minutes, and emerge unscathed. Keeping the lights on is a 3300mAh battery, and Android 7.0 Nougat is pre-installed. While the LG G6+ does feature the "modern" look with the thinner bezels and 18:9 aspect ratio, it will still be powered by a chip that is three generations old. Having said that, it should be able to handle anything you throw at it. If interested, check on the appropriate sourcelink below. Way too much money for that old of a device.